I wanted to prepare my Thanksgiving turkey differently this year. I’ve been cooking it the same way (my Grandfather’s way) for 11 years now and it’s time for a change. My grandfather always cooked a good turkey with a simple process — roasting with butter, salt, pepper and onion salt. It was always good, so I didn’t mess with it. Last year we tried a friend’s deep fried Cajun turkey and it was really good!. The flavor was great, but not real juicy. The next thing I knew, a Martha Stewart Living magazine showed up in my mailbox. I didn’t order it, but since I love to cook I thought I would check it out. 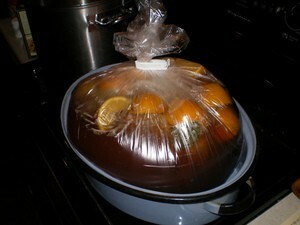 Well, since it was her Thanksgiving edition, I had found my answer: brine the turkey! 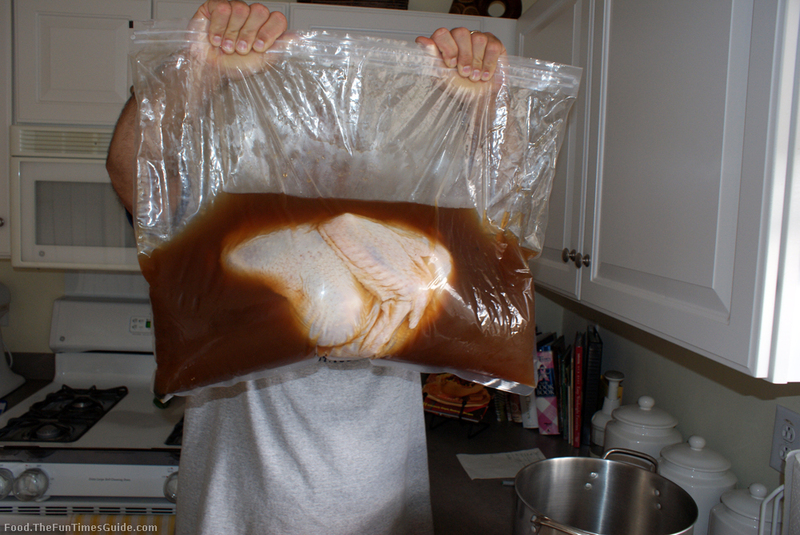 If (like me) you didn’t know, brining a turkey is soaking it in a salty water solution. This is similar to a marinade process, but it helps hold the meat’s moisture in while it cooks. Hence, the juicy turkey that I was wondering about! 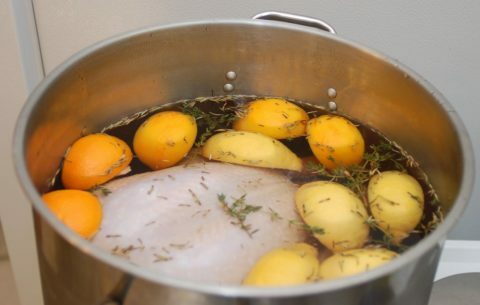 Brining works best for roasting or grilling a turkey. You need to thaw the turkey completely first. Then soak the turkey for 8 to 24 hours (depending on the size of your bird and your timing) in a brine solution — either in the refrigerator or a cooler with ice, keeping it around 38 to 40 degrees. Finally, dry off the turkey with paper towels, and then cook it. Now, according to Martha, don’t overdue the salt in the solution and also add in other flavors such as sugar, garlic, lemon rind, etc. Here is Martha Stewart’s recipe for turkey brine. After what I learned from Martha, I had to consult my real advisor: The Food Network. I found that Alton Brown has the same advice. He also has a great 5-star recipe for turkey brine. I will be trying Alton’s recipe this Thanksgiving, but I have to thank Martha for introducing me to brine. UPDATE: Here’s How My Brined Turkey Turned Out! I made the brine the night before Thanksgiving. (You can also buy brine from Williams Sonoma or Amazon). To do that, I boiled all the contents in the recipe and then let it come to room temperature. Finally, I cooled it in the refrigerator. 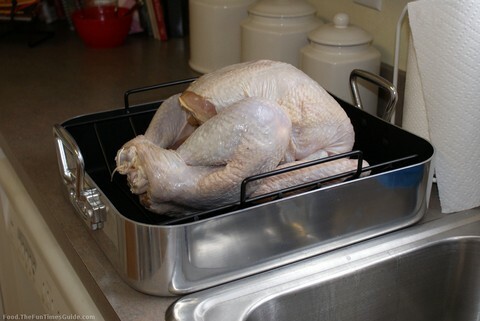 On Thanksgiving day, just before I was ready to roast the turkey, I rinsed and dried it. The results: It was a moist turkey! I followed Alton’s turkey brine recipe (above), and it turned out great. I will always brine my turkey from now on! I live in Franklin with my husband and our toddler son. I enjoy writing about our experiences visiting places in Franklin, Cool Springs, and the Brentwood area.